Thank you for taking a few moments to read about a very remarkable car-care product. Its name? WET PAINT Automotive Polishing Glaze, or simply, "Wet Paint". Wet Paint was introduced to the public in June of 1988 after an 18 month test program confirmed suspicions that we had a genuine miracle on our hands. Judging from the reception it received, we werent the only ones who thought so. a serious piece of work! Wet Paint is not a "Diet Lite" version of someone elses obsolete formula. Rather, Its a carefully conceived, full-bodied, concours performer capable of out-muscling brands old enough to grow beards. Brands that have relied on name recognition to sell their product. Brands that will forever be playing catch-up. Anyway, now that weve introduced ourselves, wed like to invite you to sit back and examine in detail this fascinating new concept in hi-tech auto polishing. Lets see if we cant wet your appetite! First of all, what is Wet Paint? 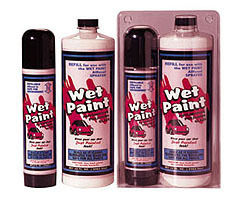 As the name implies, Wet Paint was designed to leave your vehicle looking as though it just left the paint booth. Its designation as an "Automotive Polishing Glaze" stems from its ability to attach a high-voltage shine to everything it touches, including less than perfect paint. Wet Paint is capable of generating exceptionally smooth, highly reflective surfaces blazing with color and brilliance. But, our shine is only part of the story. PLEASE FASTEN YOUR SEAT BELT. WE’RE GOING FOR A RIDE! One of the truly outstanding features of Wet Paint is its ability to clean, polish and protect the finish of a dirty vehicle without scratching any of its highly vulnerable surfaces. While most people would cringe at the mere thought of dirt and grime being massaged into the finish of an expensive vehicle, we suggest the following test to prove that Wet Paint really does work. Start the test by polishing an "inconspicuous area" such as a dirty spot under the hood or trunk lid, or behind a door opening. As you gain confidence, try polishing a dirty chrome wheel, a taillight lens or a lower quarter panel. It wont be long till youre boldly using Wet Paint on every hard, non-porous surface in sight, including the ones that really matter. In a few short minutes, the truth will become readily apparent: Under normal circumstances, washing a vehicle before polishing it is a total waste of time! Furthermore, youll soon begin to realize that previous car washings were the source of many of the scratches already on your vehicle! To elaboratewashing a car each time its dirty will eventually take its toll. Sooner or later, the paint will become dull and dry thanks to repeated applications of soap and water. To compound the crime, dry surfaces are much more susceptible to scratches than are surfaces protected by a slippery coat of Wet Paint. In time, a frequently washed vehicle will accumulate an infinite number of scratches called "feather scratches". Some of these are the result of high-pressure water equipment blasting dirt particles from the finish. Others originate during the scrubbing process; still others during the drying phase. As youre about to find out, Wet Paint was specifically bred to resist scratches and is totally incapable of dulling a vehicles finish. On the contrary, youre going to be fielding questions about the incredible shine on your vehicle, which will only make you wish youd stumbled onto Wet Paint a lot sooner! So, exactly how does Wet Paint prevent scratches? Actually, its a combination of factors, each working simultaneously and independently from one another. When you spray a section of an unwashed vehicle with Wet Paint (notice we said, "spray" – we’ll get to that in a moment), each atomized blast of pink liquid either coats or surrounds dirt particles with thousands of microscopic droplets, each less than .015" in diameter. The droplets that COAT the dirt particles begin to soften and loosen the grime immediately thanks to the generous supply of cleaning agents contained in the formula. Meanwhile, the droplets that SURROUND the dirt particles create a “hydraulic barrier” between the painted surface and any abrasives that haven’t yet dissolved. Thanks to a blend of innovative lubricants, this “liquefied grime” is held in suspension until it’s absorbed by the pile of a terry cloth or microfiber polishing towel. Although the application towel is absorbing all the dirt, its also becoming saturated with lubricants as you continue to polishthus, it never reaches a point where it becomes too abrasive to use. A single application towel will easily polish an entire vehicle. Another distinguishing feature of Wet Paint is its ability to clean and seal glass. In fact, Wet Paint is capable of bonding to glass for a year or more. Youll see this yourself each time you drive in rain. Instead of lying in sheets on the windshield, water will scatter off the glass like its being chased! Wet Paint makes bug removal easier, too. Just as TEFLON™ prevents eggs from sticking to the bottom of a frying pan, Wet Paint reduces the adhesion of splattered bugs on grilles and windshields. Only we do it without TEFLON to avoid some of TEFLONs undesirable qualities. As you may know, most waxes and sealants are NEVER recommended for use on glass because of the oily film (rainbow-colored hue) they leave behind. This can be extremely hazardous under certain conditions, such as when headlights approach at night or when windshield wipers are turned on during a light rain. Because Wet Paint leaves no oily residue, it is totally safe and highly recommended for all your glass-cleaning needs. Fact is, youll be the one highly recommending it once you see how astonishingly clear and bright a piece of glass can get! Now, are you ready for this? Wet Paint comes packaged in the industrys first refillable aerosol bottle! For high-volume users (detail shops, auto dealers, body shops, car rental agencies, etc. ), the need to purchase cleaning products in large quantities is a necessity. Unfortunately, aerosol containers are both small and expensive, thus theyve never been much of a hit with high-volume users. Well, now you can have your cake and eat it too because Wet Paint can be purchased in economical refills and applied with our refillable aerosol. Altogether, Wet Paint is available in three different configurations: an 8-ounce "AEROSOL"; a 32-ounce "REFILL"; and a modified combination of the two known as the "COMBO-PAK". First, the 8-oz. aerosol. Because aerosols meter out their contents in the form of a fine mist, a little Wet Paint goes a long way. Smaller cars are typically polished with 2 ounces of liquid, which means you can expect up to four full polish jobs from a single bottleincluding windows! When the bottle is empty, simply remove the spray mechanism, top it off with a fresh supply from our 32-oz. REFILL bottle and youre set to go again. This value-packed unit provides four times as much fluid as our spray bottle for only twice the price. Instead of four polish jobs, you get sixteen! The COMBO-PAK, our best value of all, provides a 32-oz. REFILL and an EMPTY AEROSOL SPRAYER in one package. This saves the hassle of having to return to the store for a REFILL once the original spray bottle is empty. Furthermore, the "cost-per-ounce" factor of the COMBO-PAK is lower than the sum of its parts, making it an attractive package for the frequent user. Right now, youre probably saying to yourself, "I understand the part about refilling the spray bottle, but how in the world do you repressurize it?" Easy! Would you believe you can do it yourself in less than 15 seconds? The cap on the Wet Paint bottle acts as a portable air-compressor of sorts. Simply place it in positionon top of the bottleand begin pumping it up and down using short 2" strokes. A dozen or so pumps will convert the bottles non-pressurized contents into a supercharged workhorse! Because the bottle is pressurized with AIR ONLY, weve dubbed this ingenious sprayer the Wet Paint AIRosol. Its important to note, too, that the Wet Paint AIRosol cannot be over-pressurized even if over-pumped. A pressure relief valve limits the amount of air that can be forced into the bottle. Why an AIRosol bottle in the first place, though? Why not a trigger sprayer, or a simple pour-as-you-go bottle? First of all, because Wet Paint is of such low viscosity, pouring is out of the question. It pours right through a towel, for example, and will easily run off the hood of a car to the ground. A trigger sprayer or finger pump sprayer is a big improvement, but only to a point. Our high-quality Wet Paint AIRosol, on the other hand, meters out fluid in the precise pattern needed for our "polish over dirt" theory to work. Plus, it requires only light pressure on the spray valve to make it perform. No squeezing on a trigger till your wrist aches; no dribbles at the end of each pump stroke. Unlike conventional aerosols, ours produces no COLD SHOCK as you spray. Additionally, the bottle is just the right size. It fits comfortably in your hand while spraying and slips easily into a front pocket between sprays. 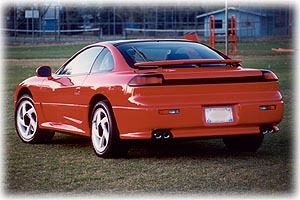 Plus, you’ll really appreciate the convenience an AIRosol sprayer affords when polishing the lower half of a vehicle. To illustrate this last point, let's say you're polishing the driver's door, for example. With our AIRosol sprayer, all of the product goes straight to the door and stays there without dripping to the ground. Not only that, but a blanket of pink droplets makes for a really outstanding visual aid; thus, one is less likely to waste polish in the first place. This is one of the reasons it takes but 2 ounces of Wet Paint to "wash & wax" a car the size of a Ford Mustang. Fact is, it costs less to clean, polish and protect a vehicle with Wet Paint than it does to merely wash it at the local SCRATCH-O-MATIC car wash. Need we say more? You bet we’re going to say more! The question is, just how good can a spray wax be? For most spray waxes…not very. However, Wet Paint is not most spray waxes. If used occasionally in place of a wash-job, Wet Paint will make the paint on an older vehicle look brand new. If used on a new vehicle, the paint will actually look better than new. Additionally, should you choose to buff Wet Paint into the surface with a power buffer, a ‘one-time application’ will sear in the shine and protection for up to a year, depending on conditions. With older cars, the more neglected the paint, the greater the need for Wet Paint to be applied with a power buffer. In instances of extremely dull paint, it may even be necessary to go over the vehicle with a rubbing compound first. However, in most cases—even cases of advanced oxidation, like when you’re able to write your name on the hood with nothing more than a wetted finger—Wet Paint can usually get the job done by hand. Either way, the results will truly astound you. In fact, don’t be surprised if friends misinterpret your two-dollar polish job for an expensive new paint job. Personally, we can’t think of a more cost-effective way to increase the value of a vehicle at trade-in time! If Wet Paint can rejuvenate this old junkyard dog, think what it can do for your vehicle. Professional users of Wet Paint will especially appreciate the product’s remarkable ease of use—a procedure that’s as simple as SPRAY & BUFF. Vehicles may even be machine-buffed while dirty without harming the finish or clogging polishing bonnets. Although wool bonnets work best when power-buffing vehicles manufactured before 1990 [or thereabouts], microfiber bonnets are the perfect choice for all vehicles manufactured after that date. Of course, terry cloth bonnets or foam pads may be used as well, just as orbital-type buffers may be substituted for rotary units. However, if you’re the type who refuses to settle for anything less than “trophy-winning sizzle”, nothing beats a variable-speed rotary style buffer equipped with a microfiber bonnet. Better still is the fact that Wet Paint will leave no buffer swirls regardless of the type of pad or buffer used. In fact, Wet Paint can be used – and should be used – to remove swirl marks left by other cleaning products (rubbing compounds in particular). All that is required is that you buff ‘cross-grain’ or in small circular motions. And, as if that weren’t enough, you’ll find it virtually impossible to burn paint when using this super-slippery polishing glaze. Wet Paint reduces surface tension to such an extent that very little heat is generated during the buffing process. Without heat, the likelihood of inducing buffer burn is practically nil. weve hardly scratched the surface (PUN INTENDED). Heres another example of Wet Paint wizardry: "Wet Paint will not stain black chrome!" Much of the trim and many of the protective moldings on todays cars and trucks is either plastic, rubberized, or painted a flat color. Today these materials come in a variety of shades, but in the early days they were often blackhence, the name "black chrome". When black chrome is polished with most polishes and waxes, it turns white after drying and is all but impossible to remove. Wet Paint, on the other hand, is easily removed from black chrome, provided one does so before it dries. Even if you don't catch it in time, the light haze that remains is easily removed with an Armor All type product or a solvent such as WD40. Will Wet Paint stick to Wet Paint? Body shops, too, will rejoice knowing that no special preparation is required when repainting vehicles treated with Wet Paint. To prove this to yourself, polish an old damaged fender, a metal barrel, or some other large object representative of an automotive body panel. After polishing the panel thoroughly with Wet Paint, try painting its surface with an ordinary aerosol spray paint. Amazingly, paint will bond securely to the panel with nary a hint of "fish-eye"! For paint to adhere to such a slippery surface without benefit of prepping seems downright magic, but in truth, its a matter of simple chemistry. Of course, were not even remotely suggesting that Wet Paint be used as a paint primer. But we are saying that body shop personnel will not be plagued with expensive, time-consuming preparation difficulties when repainting vehicles treated with Wet Paint. Why Polish the Edge of the Hood? Ever notice the way most waxes and polishes cake-up around panel edges? Six months after a vehicle has been polished, those big white pasty layers are still clinging to edges of the hood, trunk lid, gas filler door and just about everything else. Not so with Wet Paint. Of course, if you own a white car, youll probably never appreciate this added bonus as much as the rest of us! Another outstanding feature of Wet Paint is its versatility. Although officially designated as an "Automotive Polishing Glaze", Wet Paint may also be used on a wide variety of non-automotive surfaces. Painted metals, glass, chrome, mirrors, smooth plastics, ceramics, lacquered woods, porcelain, brass, aluminum and fiberglass are but some of the many surfaces that may be successfully polished and protected with Wet Paint. In short, Wet Paint may be used on any hard, non-porous surface. With this kind of versatility, Wet Paint can take the place of many household cleaners and polishes. Windows, mirrors, sinks, bath fixtures, TV & computer screens (glass screens only), ceramic tile, microwave oven doors, stoves, refrigerators—these are just a few of the many items around the home that can benefit from this truly remarkable substance. In addition to its cleaning and polishing abilities, Wet Paint will help make future cleanups a breeze while reducing the tendency of these surfaces to collect fingerprints! Wet Paint works equally well on aircraft, boats, RVs, motorcycles, snowmobiles, steel siding and many other high-ticket items that spend a large portion of their existence exposed to the elements. Valuable investments such as these are certainly worth the easily affordable insurance of Wet Paint. One of the really neat things about Wet Paint is that it allows you to clean and polish a vehicle without having to wash it first. But what if the vehicle is already wetsay, from an errant lawn sprinkler? Is it then necessary to dry it first? Or worse yet, is it necessary to wash AND dry it before applying Wet Paint? Well, unless the vehicle has just been pulled from the bottom of a river, you should be able to polish over any wet areas. The only deviations from our standard bottle directions are as follows: (1) Apply Wet Paint more liberally than normal to offset the effects of water dilution. (2) If the application towel becomes excessively wet, replace it with a dry one. Think of the benefits to be derived from technology such as this. Say youre out splashing through pothole infested streets during a late afternoon drizzle. You get home and park the car in the garage - wet and dirty. RATS! Youve got a wedding to attend in a two hours. How are you ever going to find time to give it a bath? Youve barely got time for your own bath. Well, all you need are two towels, a few ounces of Wet Paint and a half hour of your time. PRESTO! Not only will you make the opening bars of Mendelssohns "Wedding March", youll have a neat story to tell afterwards at the reception. Wet Paint is one of those rare species of products that can make a grown man giggle each time it’s used. In addition, we predict it will become the one product you reach for whenever something needs cleaning, shining or protecting. But even if you only use Wet Paint to polish the family chariot once or twice a year, you’ll appreciate the fact that we’ve reduced a nasty 3-hour Saturday afternoon job to a half-hour of…well, giggles. Don’t you owe it to yourself to give Wet Paint a try? Besides preserving our precious water resources, you’ll be doing your part to KEEP AMERICA BEAUTIFUL!